Coach Kelly Clarkson chooses Jej Vinson over Beth Griffin-Manley in The Battles. 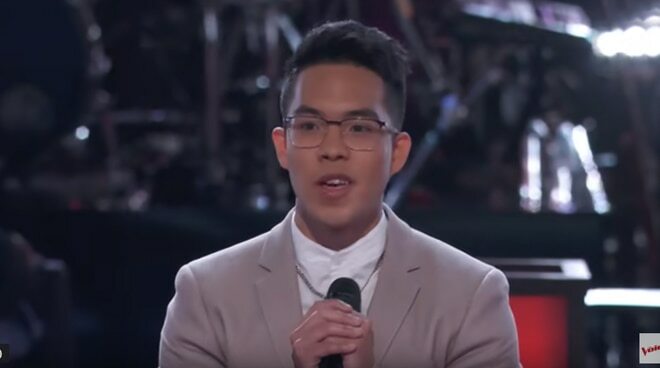 Pinoy singer Jej Vinzon went head-to-head with Beth Griffin-Manley in The Voice US, Sunday evening (March 24, US time) and eventually landed a spot on Team Clarkson in the next round of competition. With their Coach Kelly Clarkson giving them the task to perform "Jealous" by Labrinth, the two singers were given praises by coaches John Legend, Adam Levine and Blake Shelton, saying it would be hard to pick the winner between the two. "Both of you I wanted on my team, both of you were incredible today. Jej, your tone was both interesting and cool. Beth, the same thing actually. Both your voices don't sound like the song I heard before, you sounded great doing it," John commented. "I'm so excited you all exactly did what I asked you because you are so talented. That's why not only the unison parts were so in sync, but what you did in harmony was note on note on point. That's insane, that's how talented you both are," Kelly remarked. The LA-based Filipino singer will be moving on to the next round. Although Beth lost the battle, she was fortunately 'stolen' by Team Legend.